The council and Human Relations Commission get ready for their Tuesday night work session, which ended in harmony. The dispute over changes in the 2007 Albany ordinance that created the city’s Human Relations Commission ended without acrimony Tuesday. In a two-hour work session, the council and commission worked out wording that seemed to reflect, more or less, what everybody wanted to say. The flap began when the commission sprang a revised ordinance on the council on June 28. The council declined to take final action on the change that night and two weeks later voted 4-2 to turn it down. The council’s votes prompted a wave of social-media denunciations. 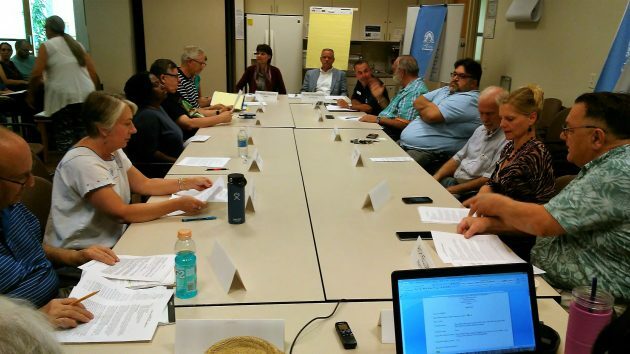 The volunteer commission, created to be advisory to the council, wanted the words “diversity, equity and inclusion” included in what amounts to its mission statement, and the phrase “harmonious relations” dropped. At Tuesday’s joint work session, Chris Equinoa and others of the commission pointed out that the added wording was already present in the city’s policies including its strategic plan. Graham Kislingbury, another member, said the panel was just trying to update its mission statement. The discussion showed that the dispute arose partly because of the way the change was proposed to the council, without advance conversations in a work session. But Javier Cervantes, the panel’s chair, said he thought they were going through proper channels. Councilman Rich Kellum touched on another point. When the government talks of “diversity,” it usually wants numerical targets for minority representation, and organizations risk sanctions if they fall short. He suggested that any change be run by the city attorney. If we MUST be PC, I guess that’s not a bad statement.